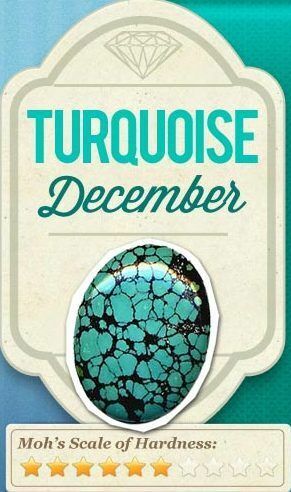 Turquoise is one of the oldest known gemstones. The Egyptians were mining turquoise in the Sinai as early as 5,500 BC. The Persian word for turquoise is “ferozah” or “firozah,” which means victorious. Did You Know? Turquoise gems attracts money, success and love. It’s “powers” include protection, healing, courage, friendship, and luck. Relaxes the mind, and eases mental tension. This gemstone was also thought to promote prosperity. Interested in gemstones? Check out our Birthstone infograph by Month: Gemstones by Month.